A trigger point massage that will ease aching and tired muscles helping soothe your body and mind. Working areas that may be knotty, swollen or sore leaving you feeling relaxed and de-stressed. Instant Relaxation. Using warm stones the heat radiates through the body boosting relaxation and releasing muscle tension. One massage stroke with a warm stone is the equivalent of 5-10 of your hand. 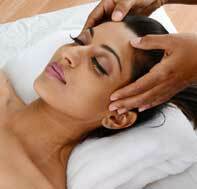 A revitalising therapy that relieves tension in the head, neck, shoulders, upper back and arms.